I have voodoolab ground control, gcx and tc electronic G major 2 with mesa mark v head. I routed stompboxes like Ts9 and compressor with gcx but i cant control G major's effects seperately. Is there anyone who has any idea? Go into SetUp Mode (See Page 6 in your GCPro Manual) and identify your GM2 as Device 1. Make sure you enter the correct MIDI Channel here as well. I suspect the GM2's default channel is 1 so you should be good to go without making any changes. Configure your CGPro in 4-Presets/Bank mode (See Page 14 in your GCPro Manual). The bottom row of buttons (large numbers 1 thru 4) will now control both your GCPro and your GM2 presets, and the upper two rows of buttons (smaller numbers 1 thru 8) will control your GCX loops. If your GM2 preset numbers are off by one number, see Page 7 in your GCPro Manual to adjust the Start Number. If you want to control certain GM2 effects blocks separately, you will need to program IA buttons to send the appropriate Control Change numbers to the GM2 via MIDI. I suspect you may have to get those Control Change numbers from TC Electronics. I want to use preset is that, 6 buttons I want to manage. There is a Delay, Reverb and Chorus effects in first preset at the GMajor 2. How do I make this process, thank you for all. 1. Press both Setup buttons on the GCP to enter setup mode then press button 2 for Device Name/Channel. Name your G Major 2 and set it to the MIDI channel you want to use and save. . .I use channel 1 for my G Major. 2. Go to your G Major 2, press MIDI then set the channel to match the GCP and save. The Bank buttons scroll between Instant access buttons, the < CURSOR > buttons scroll between GCX and Loop and the -/NO and +/YES buttons scroll up and down to make different selections. When you get to 4, press the +/YES button to scroll through the 4 GCX selections until you get to G MAJOR 2 (or whatever you named your Major 2 in step 2) then press CURSOR > and scroll the CTL (-/NO and +/YES as appropriate) until it matches the value that you noted for the G Major 2 Delay in step 4. Repeat for 5 and 6. Batman wrote: 1. Press both Setup buttons on the GCP to enter setup mode then press button 2 for Device Name/Channel. Name your G Major 2 and set it to the MIDI channel you want to use and save. . .I use channel 1 for my G Major. Right now, my set up is wireless into tuner, tuner out to a MXR smart gate, gate out to the head. 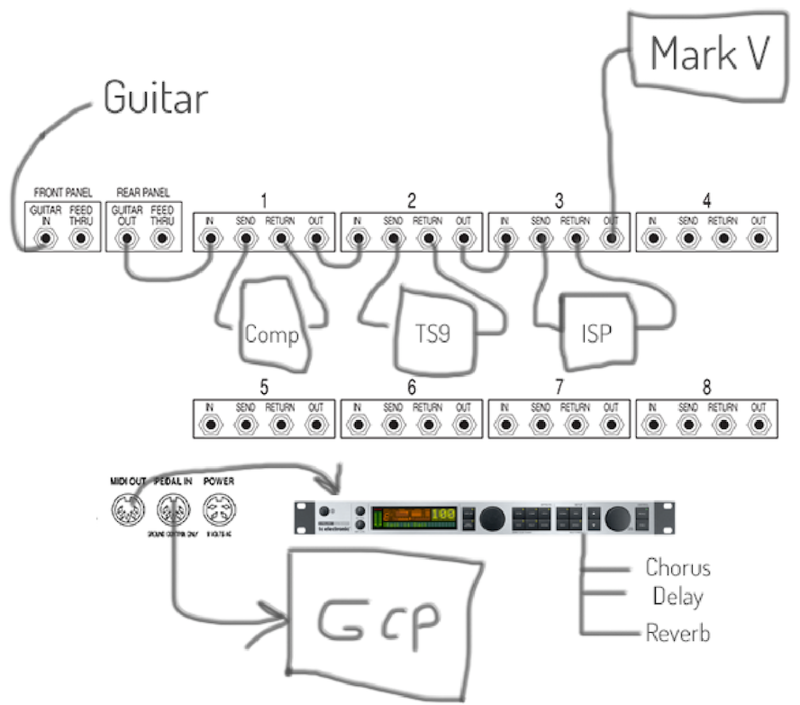 I have the G Major in the effects loop of the Mark V. And I assign the loop to Channel 1 (clean channel). And I use a Mark V foot controller. Question (and hopefully anyone has an answer ). Instead of the GCX, can I use a controller switcher (photo below) instead of the GCX to change channels on the Mark V? Also, I would like to run the G Major only for the clean channel and maybe use different effects for solo boost. Possible? Any help is appreciated. Thank you. The Control Switcher will work using the External Switching jacks on the back of the amp, no problem! On the 90Watt Mark V you should be able to switch the Channels, EQ and Solo Boost. You can connect the G-Major to the FX Loop on the Mark V and set the FX Loop to Channel 1 only.